Sushi counter at Minori, originally uploaded by Camemberu. Minori Dining and Sake Bar has been open at UE Square for a while now. 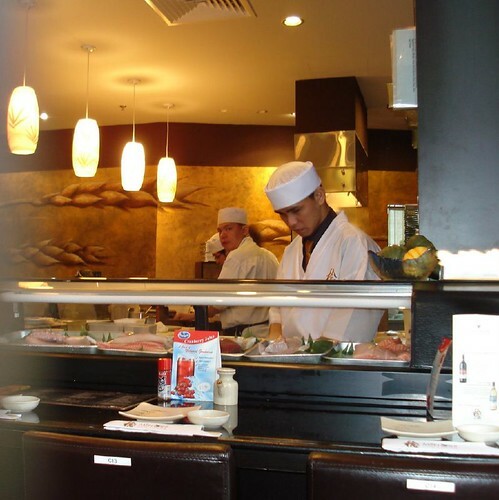 The former owners of Hanabi set up Minori with a similar a la carte buffet concept for Japanese food. There have been a flurry of mixed reviews despite a positive press article. So I did not come here with high expectations, only curiosity as to how the place actually fares. Welcome appetiser in shot glass, originally uploaded by Camemberu. I had heard it can get really crowded but it was empty when I arrived today at lunchtime with my friend. As such, we didn't encounter any service problems or slowness that seemed to plague the restaurant in its earlier days. However, it did fill up considerably still past 12.30pm but service did not suffer too much. The waitresses (some seem to be from Myanmar) were quite patient and even took the effort to recommend popular dishes when we seemed stumped by the wide menu choices. Sashimi moriawase, originally uploaded by Camemberu. 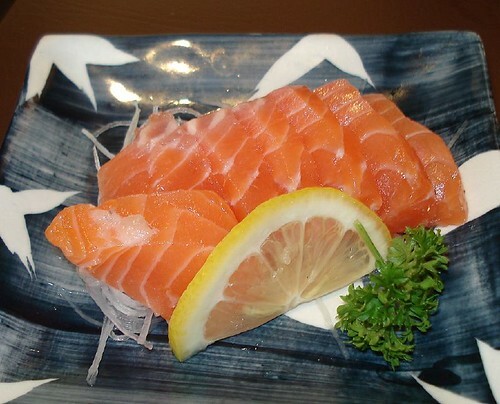 One of the chief reasons Singaporeans love a Japanese a la carte buffet is the unlimited orders of sashimi. 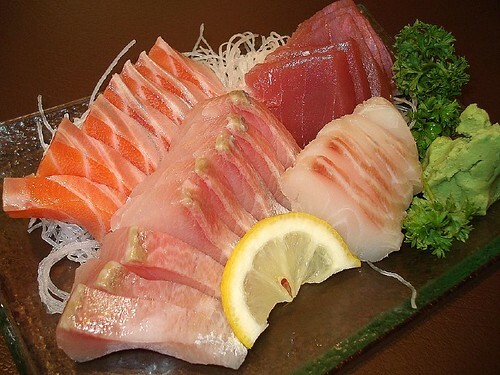 At Minori, you get a choice of salmon, tuna, yellowtail, snapper, black king fish, octopus and cuttlefish. However, I think sashimi at Ikoi's is sliced much more generously, and tastes better too. Jagaimo sarada (potato salad), originally uploaded by Camemberu. I will go through the rest of the food just very briefly. We ate a lot of dishes - really easy to do so as the portions served are very small. 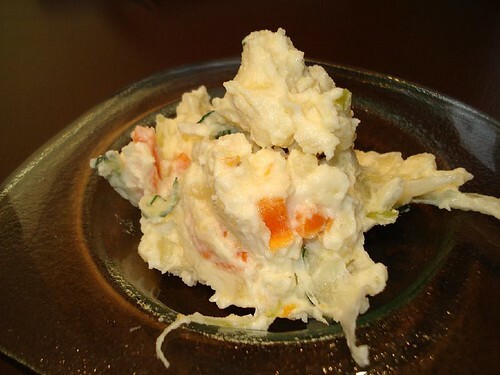 The potato salad was creamy but light-tasting, served on an interesting raised glass platter. 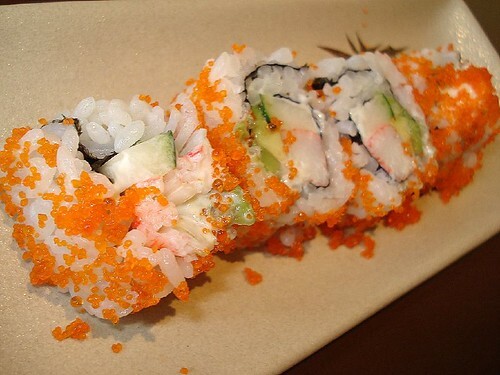 California maki, originally uploaded by Camemberu. The California maki was messy but tasted passable. We had a repeat portion of this. Spider handroll (fried soft shell crab) and Una kyu handroll (grilled eel with cucumber), originally uploaded by Camemberu. 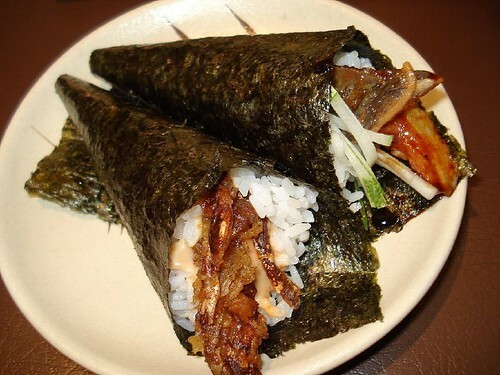 Handrolls here are not spectacular. Mainly because the dried seaweed sheets they used had a musty odour. Probably an inferior quality or type of seaweed used. And it wasn't crisp nor easy to bite through. Shiitake, buta to garlic (grilled pork belly with garlic) and tebasaki, originally uploaded by Camemberu. 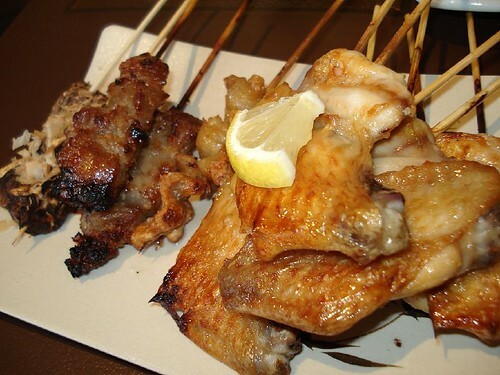 Minori also differs from Hanabi in that it offers grilled skewered items, mostly of chicken parts. 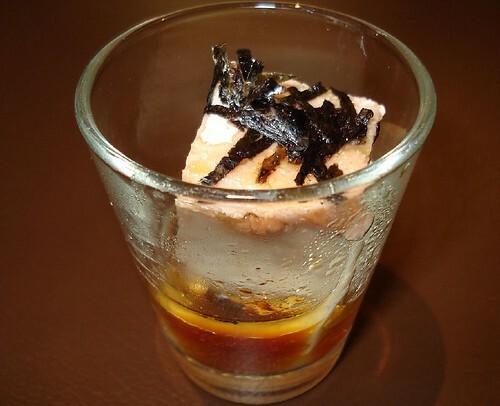 The "buta to garlic" is probably the only pork item there, fatty pork belly cubes strongly laced with garlic. The tebasaki (chicken wings) strangely butterflied here, tasted a bit too plain. Kawa (chicken skin) was not crisp enough. 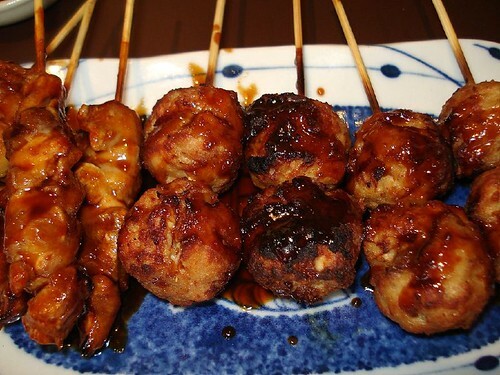 Yakitori and tsukune, originally uploaded by Camemberu. The tsukune (minced chicken meat balls) were huge. They and the yakitori tasted alike. Just all right. Lacked serious punch. This is the SMALLEST ever tempura moriawase set I have ever seen. Two prawns and three thin slices of vegetable. I guess it's a small eater's single portion only. Average tasting, and the batter could be lighter. 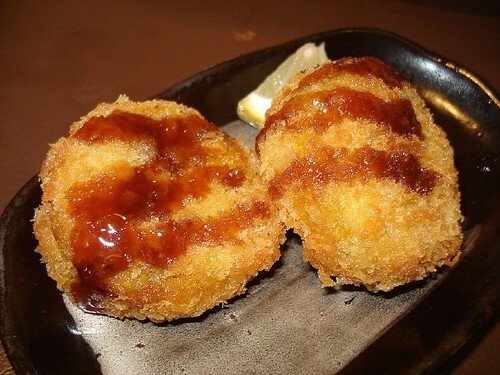 Kabocha korokke - pumpkin croquette, originally uploaded by Camemberu. This was a pleasant surprise. Sweet creamy pumpkin mash greets you as you bite through the crisp breaded exterior. It can be really hot though, so beware. 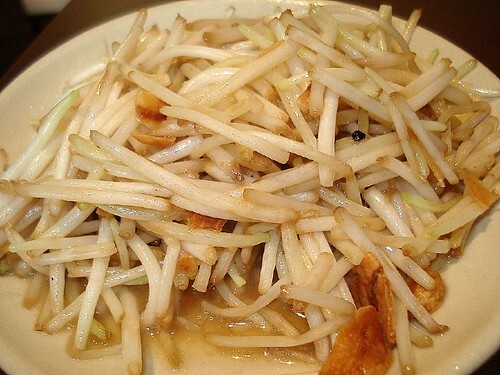 Moyashi itame (teppanyaki beansprouts), originally uploaded by Camemberu. Plain looking but intensely garlicky beansprouts from the teppanyaki section. Not bad. 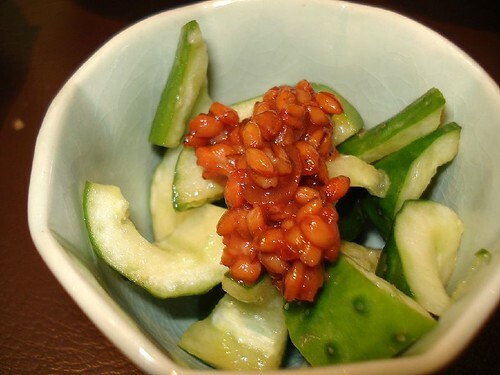 Morokyuri miso (cucumber with bean paste) appetiser, originally uploaded by Camemberu. Refreshing kyuri (Japanese cucumber) in this appetiser but I didn't care much for the miso bean paste - a bit too close to "taucheo" (Chinese bean paste) for my liking. 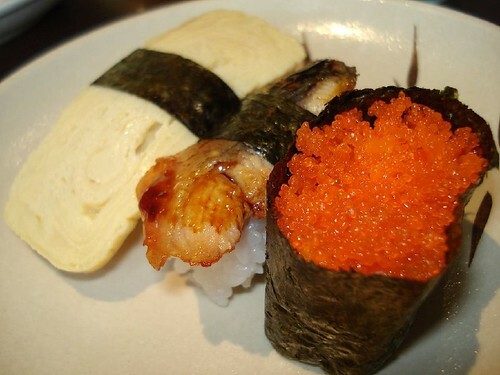 Assorted sushi - tamago, unagi and ebikko, originally uploaded by Camemberu. Sushi isn't their forte, I guess. Or maybe I just really don't like that dried seaweed that they use. It made me long for the good quality, crisp seaweed that Sushi Kikuzawa uses. Hiyayako, originally uploaded by Camemberu. Two bites and this one dish is gone. 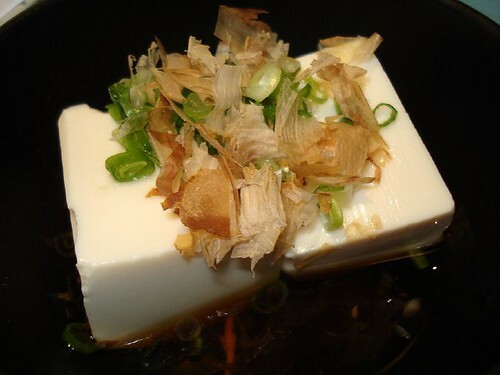 Cold tofu in soy sauce topped with bonito flakes and scallions. 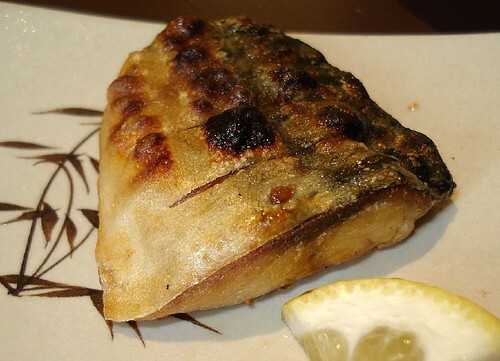 Saba shioyaki (grilled mackerel with salt), originally uploaded by Camemberu. Everything here is in tasting portions. Which is nice too, it lets you try more dishes from across the menu. 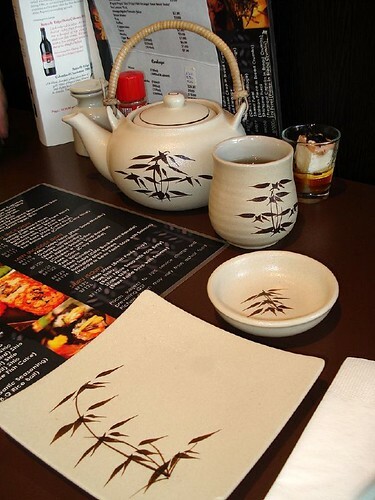 The saba shioyaki is all right but your mind is on the next item already. Momo sarada (peach salad), originally uploaded by Camemberu. 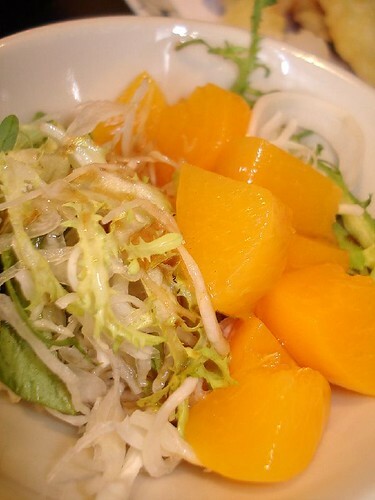 This was quite nice, a sweet fruity salad with a tart, soy-sesame dressing. The peach is of the canned variety, of course. 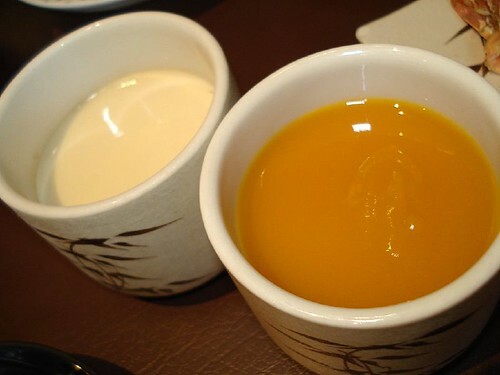 Fukahire chawanmushi and Pumpkin chawanmushi, originally uploaded by Camemberu. There are two kinds of chawanmushi here, the kabocha (pumpkin) one just has the addition of a layer of pumpkin puree on top. The mixture is a really surprising attack of flavours on your palate - both sweet and savoury combining to jolt your senses. The egg custard is quite smooth. and has lots of nameko mushrooms at the bottom. Yum. Tori karaage (fried chicken nuggets), originally uploaded by Camemberu. This was one of the unexpected highlights. I thought they did their tori karaage really well. There is no oilyness on the surface and the meat inside is tender and juicy. Nicely seasoned. 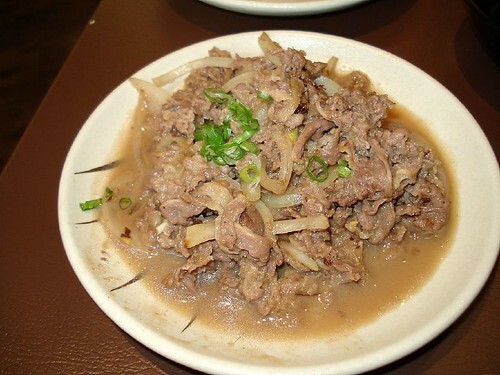 Gyuniku shogatayaki (beef with special sauce), originally uploaded by Camemberu. I have seen people rave about this here. It's like a richer-flavoured version of Yoshinoya's beef. The soft beef slices taste almost buttery. We got served a really large portion too. 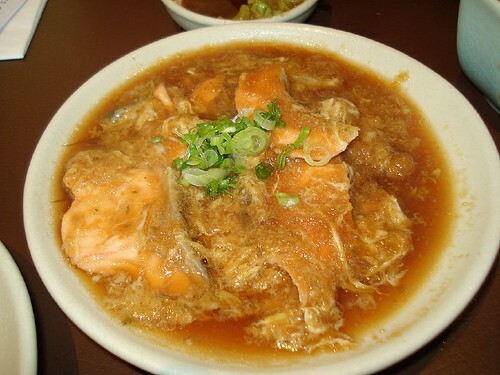 Shake Wafu Teppan (salmon with special sauce), originally uploaded by Camemberu. The salmon teppan special dish was too salty and sweet for me. Very strong hint of mirin (sweet rice wine) in the soy mixture. Understandably, they aren't the most generous with their sashimi servings. Don't expect the best of fish slicing skills here either. Some of the sashimi were still sinewy. But for the price, I don't think anyone will complain. 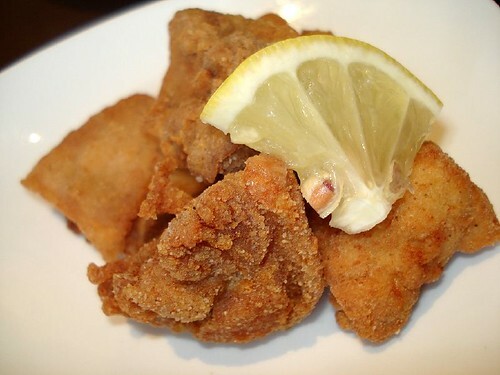 Nankotsu karaage (chicken cartilage), originally uploaded by Camemberu. 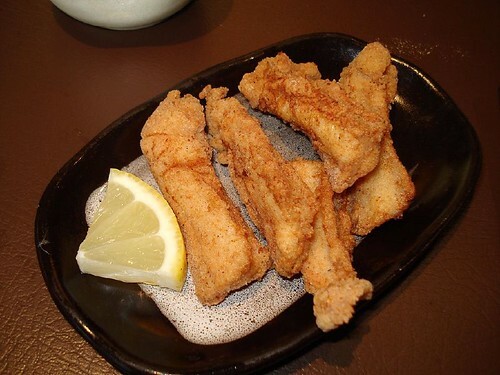 This is very similar to the tori karaage, just that it involves the breastbone cartilage. I just love cartilage. Is that really odd? 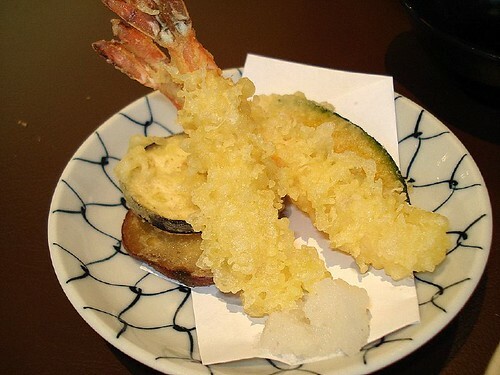 I remember even my Japanese friend looking at me strange when I ordered this at Nanbantei in Tokyo some years back. Green tea (hot or cold) and ice water available as part of the buffet, originally uploaded by Camemberu. Minori serves free-flow green tea and water as part of the buffet. Alcoholic drinks and desserts (mostly ice cream) are available separately. If you don't want the buffet, you can opt for their set meals. In summary, Minori's food is fairly competent across the board but is still very average. Much like a jack-of-all-trades but master of none. The variety is undoubtedly better than at most joints, but many of the dishes involve same ingredients done differently (as sushi, maki, handroll etc). Personally, in terms of all-you-can-eat places, I'd rather head to Ikoi or Sushi Kikuzawa for a more fulfilling experience. hi, are you a food writer? coincidently, i was also invited to do a tasting at this outlet. find it not bad too. Didally: Yeah the sushi is pretty bad but then again most sushi at buffets are. They're just fillers. The fried stuff is good indeed - great karaage! Everything else is so-so. Thoo2: Lucky you! I went on my own as a paying customer. I'm not a food writer (not professionally anyway). Congrats, I see your blog got featured in the Chinese papers! Ladyironchef: Haha, thanks. The food is as it was presented. In fact, the photos were taken rather hurriedly cos the dishes arrived quickly and we just wanted to dive in and EAT! Hey, great picture of the sashimi moriwase. Checking out your blog through the link you posted at IeatIshootIpost's site. You should really try the dry version of Mr Wong's Seremban Beef Noodles if you had not really done so. Hi Chris, thanks for the recommendation - I have tried the soup version but not the dry one. Will check it out again. I'm sorry, but I NO LONGER eat anything chinese. Chinese food is suspect at best, deadly at worst. I think that ALL chinese food should be banned in the great USA. Who's talking about Chinese food? This entry is about Japanese food. Sorry, chiffonade, if you can't even tell the difference between the two, I don't know what kind of "Chinese food" you's been having! Touting your grand ignorance like this is just going to further diminish any tiny bit of remaining respect the world has for the 'great USA'. Too bad I'm in CA!